Q: It’s so cool to see your path – you had your first top 20 in 2009 and now you’re #2 at AAA radio. A: At times it feels really fulfilling – like, we spent all this time and it’s paid off. And at other times, it feels really, really weird. Some days I’ll be driving in the car and hear [on the radio], “That was Miley Cyrus with ‘Party in the USA’ and coming up next is Michael Franti!” And it just seems so freaky for me because I’m used to being mentioned in the same breath as Public Enemy or Rage Against the Machine. It’s really a great shot in the arm after 20 years of making music. To be the new kid on the block is kind of funny. Q: How’s it been to record while out on the road? Q: Can you recall one moment or song where you’re on the road recording and had a breakthrough? A: There’s a song called “I’ll be Waiting.” That was the first song I started writing for the record, and I actually started writing it almost two years ago. I had the verses to the song all written out. The verses are all centered around this line that says, “The best things in life aren’t things.” And I describe all these things in life that are living and breathing and feeling and loving. I didn’t have a hook for the song. There was one day, we were on tour, and I was singing another old song of mine and I kind of had this little melody that I would sing on the road that wasn’t on the record. I took it and put it in “I’ll Be Waiting.” Suddenly, the song just took off. It became this kind of endemic thing when we started playing it on the road. People would sing the song and dance to it and put their hands in the air as if they were hearing it as a song they’d grown up with, but they were hearing it for the first time. It was a really amazing thing to see a song come to life like that and have the audience respond to it. Q: Appendix surgery was an influence on your record – how? A: I thought the surgery was gonna be an in-and-out kind of thing, but it was a long time being sick, and I really felt like I was gonna die by the time they got me in there and figured out my appendix had ruptured. I thought, you know – I’m a tough guy – I’ll just get in there and get the thing pulled out and come back. But it wasn’t that way at all. It was really emotional. I would cry every day. I would sit there and be so grateful to be alive. I would pull my kids close to me and hug them. I felt like I was being visited by angels. The people in my life who were there for me, were really helping me – not only on my physical journey, but spiritually getting me back together. So, there was a song that I wrote called “Gloria” for the album. I asked a friend of mine to get me a guitar, because I wanted to play guitar in the hospital, so they brought me this guitar. It had this sticker on it and it was peeling off. My friend showed it to me and I said, “Stop – there’s an angel coming out of the guitar.” And she looked at me like, “Uh, yeah, you’re on some pretty good drugs [laughs].” But sure enough, there was an outline of an angel that had been left where she had peeled the sticker off. Wow … as church bells go off! I really felt like I was being watched over by the people in my life – my friends, my family, people who wished me well online – sent me emails and message. I don’t believe in angels with white wings and halos. But there’s a power to music that I really do believe in, that it helps us to pass through emotional trauma. It was a really healing time for me. Q: You are really the first musician – songwriting, outlook, activism – who blends all those aspects of your life – yoga, Power to the Peaceful, documentaries in war zones, into one cohesive package. 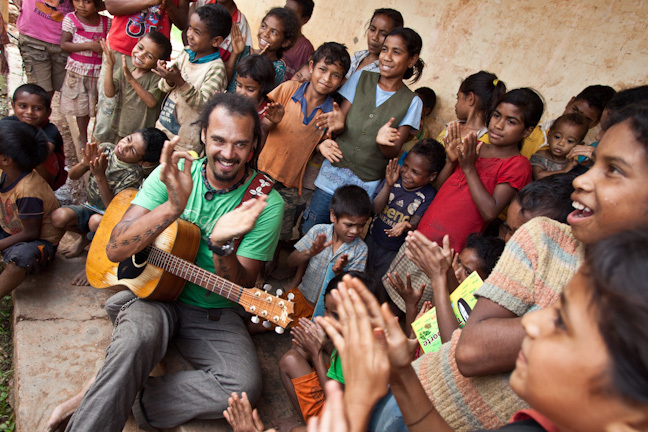 We know who Michael Franti is and what he believes in. A: I feel really comfortable in who I am today. I say that as a person having grown up feeling really uncomfortable. I was given up for adoption as a child. I was a black child being raised in a white family. My father was an alcoholic. Music at first was a way of escaping. Politically, too, my politics were angry. It’s easy when you look at the world to find things or people to point the finger at: “We’re enemies.” As I’ve grown as an artist, and as I’ve traveled the world, met people, and sat and played music and ate with people, I’ve found that my politics are less black and white, and I’m so left and right, they’re really people politics. There was one point when my politics were like after the corporation, after the man, after the government. But today I really believe that in order to solve problems, like climate change, for example, it’s gonna take the best scientists, it’s gonna take the resources of the corporate world, it’s gonna take the government, it’s gonna take the common sense of every day people, it’s gonna take the consumer power of everybody on the planet, and the grassroots idealism to get us even to make progress in terms of environmental issues. So, my music today is more about making bridges, more about making people feel like every day they can get up and look at these things and address them with love in their hearts. Q: How did you make that transition from angry young man to Mr. Peace? Was there one moment in particular? A: There are three, but I’ll put ‘em to you all in one. There was a time when I went and wrote songs about prisons and how money was being spent on prisons and not in schools. And I was invited to play in a prison, and when I got in the prison, they said, “We don’t want to hear songs about that. We want to hear songs about how much we miss our girlfriends and how much we miss our family.” I was in Baghdad, and the same thing happened. I had this song, “We Can Bomb the World to Pieces, But We Can’t Bomb it Into Peace.” When I got to Baghdad, they said, “We don’t want to hear that song, we want to hear songs that make us sing and laugh and dance.” I started to realize that that was the key to it all – to connect with people. And if you can make people laugh and dance and sing and clap and cry through a song, then you’re connecting to a place that was gonna affect people so that when they leave your show they think, “You know what? I wanna make the world a better place.” Maybe there’s something I can do at my kid’s school or I’ve never voted before, I’m gonna go vote, or something like that that would inspire people in a different way, but in a deeper way. The other thing is that I practice yoga. For me that was they way for me to really take a look at myself, examine myself. In yoga, we put ourselves in really difficult physical situations with our bodies, and we learn to breathe through it and deal with our stress and take responsibility for everything that we do. In that, I changed my politics from blaming other people to say, “What can I do?” So it’s not just can I write a song about how the world is. Maybe I could write a song about how great the world could be and then I could perform it on a street somewhere where the world wasn’t as great as it could be. Then I take my songs directly to those people and directly to those places.